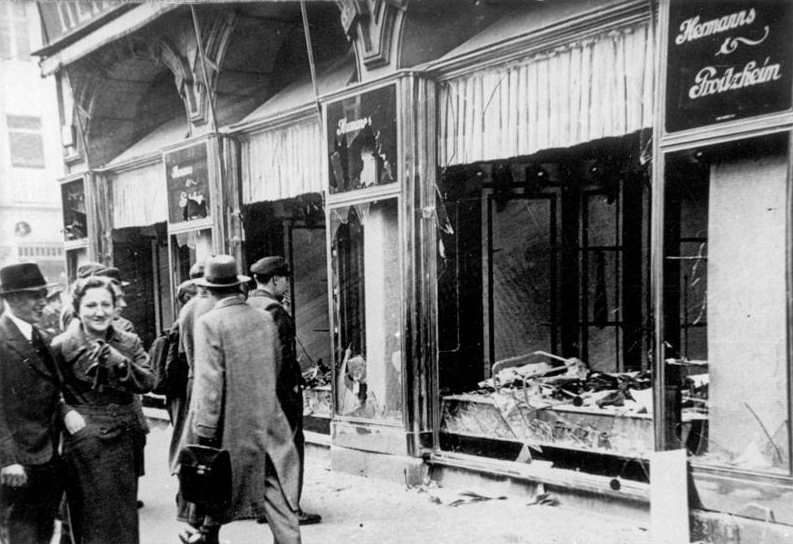 Nazi women, far fewer in number than their male counterparts in the Third Reich, still played a critical role in the lead-up to and beginning of the Second World War. 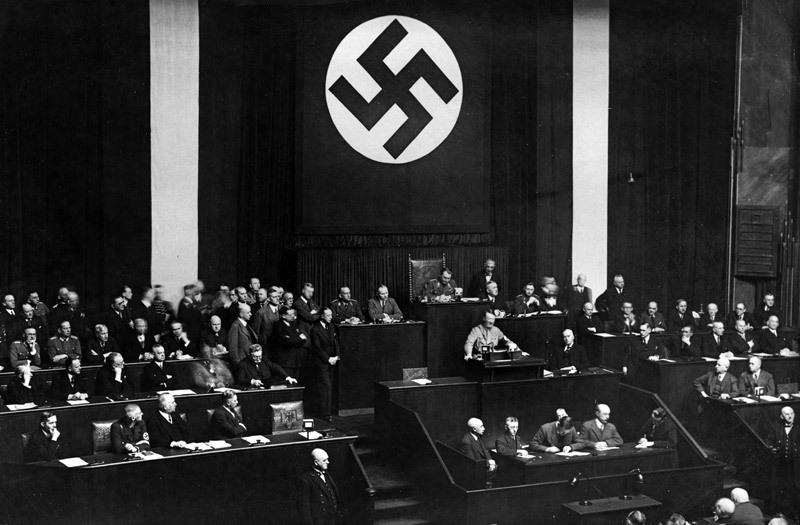 After all, Adolf Hitler had very clear ideas about the role of women in the Third Reich. Women were to be the homemakers of society, cooking, cleaning, keeping house and making themselves healthy and beautiful for their racially pure husbands with whom they would produce numerous children. From school age onwards girls were prepared for their future role and were taught appropriate subjects such as cooking and needlework as well as health and beauty. 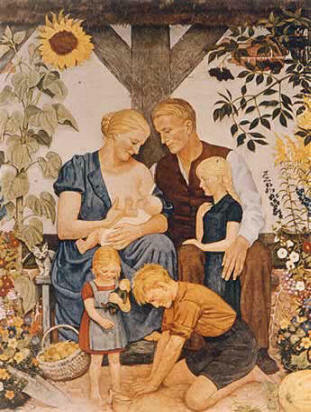 The picture (above) entitled Family, painted by Wolf Willrich shows the ideal Aryan German family. The young blond-haired, blue-eyed couple are seated outside their rural cottage with their four children. The mother wears a plain dress and is shown suckling the couple’s newborn baby. She wears no make up and has her long hair in a bun. The father is proudly looking at his newborn child with a protective arm around his wife and elder daughter. The eldest daughter wears a plain dress and has her hair in pigtails. She is watching her mother, seeming to wish for the time when she has a baby of her own. The couple’s eldest son wears his Hitler youth uniform and is making earth pots. He is watched by his younger sister who is shown holding a doll. On the birthdate of Hitler’s mother, August 12th, awards of the Motherhood Cross were given to women who had produced the most children. A gold cross was awarded to mothers of 8 or more children, silver to mothers of 6 children and bronze to mothers of four children. Not all women approved of Hitler’s view of their role. Many of these were intellectuals – doctors, scientists, lawyers, judges, teachers etc who did not want to give up their jobs and stay at home. 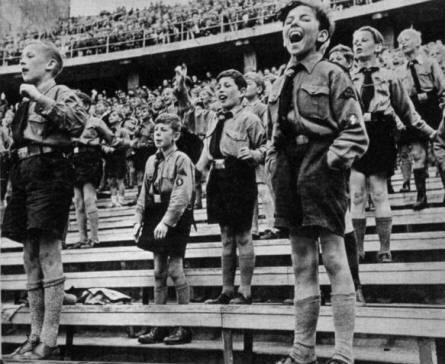 In protest against Hitler’s anti-feminist policies they joined left-wing opposition groups. If caught they faced being sent to concentration camps as political prisoners. In October 1933, the first concentration camp for females was opened at Moringen, Germany. In 1938 a second camp for women was established at Lichtenburg and in 1939 a third at Ravensbruck. In 1937, as Germany prepared for war, Nazi women were needed to supplement the male workforce and a new law was passed which stipulated that all women should work a ‘Duty Year’ of patriotic work in one of the country’s factories to further the Nazi cause. 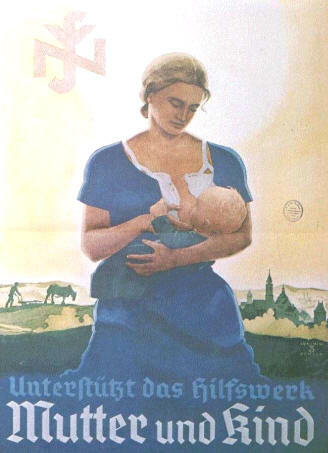 Some women were persuaded by advertising posters to volunteer for the SS support service for women. 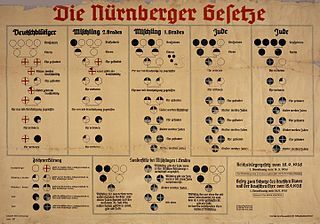 The Nazi women selected were mostly lower or lower middle class; after undergoing a period of training they were put to work as female guards at the concentration camps.